Zoltrog is now on the Earthly social networking website known as Facebook. Zoltrog is amused that he might conquer the digital as well as the physical Earth. Such a feat says great things of the puniness of your planet, mwahahaha! However, the yearning to conquer and enslave you not withstanding, Zoltrog would appreciate it if you would "Become a fan" of Zoltrog on Facebook. Also, added to the right sector of Zoltrog's Blog is a Zoltrog Facebook feed. The feed from this page is beamed to Facebook which then in turn beams the feed to this page. Yes, you read correctly, puny human. 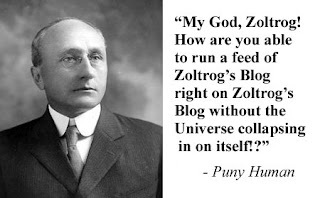 Zoltrog is feeding his blog to his own blog! It is simple, Puny Human, because I am great and you are puny.